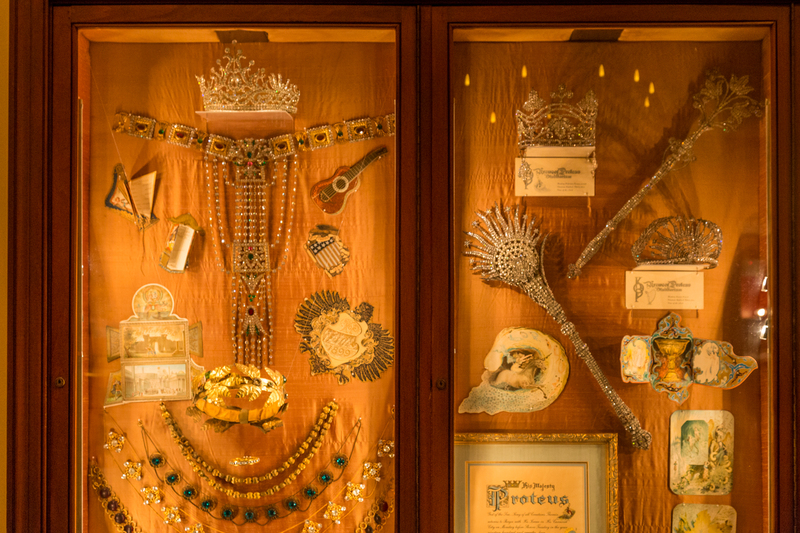 History speaks from the memorabilia-strewn walls of Antoine’s Restaurant in New Orleans, the oldest family-run restaurant in the United States. They tell extraordinary tales from the past 175 years. 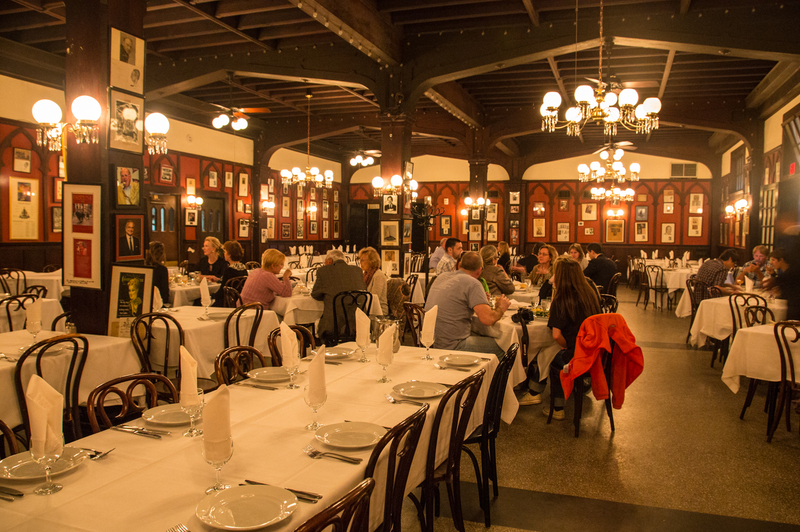 Countless celebrities have dined at the tables; these include U.S. presidents, the Pope, General Patton, Al Capone, Elizabeth Taylor, the Duke and Duchess of Windsor and numerous Hollywood heavyweights. I recently had the opportunity to meet Rick Blount, the CEO and fifth generation relative of the original founder, Antoine Alciatore. He shared some of the stories behind the world-renowned establishment, famous for its French-Creole cuisine (originally the menu was only in French), impeccable service and unique atmosphere. In 1840, 18-year old Antoine Alciatore moved to St. Louis Street in New Orleans, just one block from the spot the current location. He felt at home in the French-speaking city of extravagances. After a brief period in the kitchen of the St. Charles Hotel, Antoine opened a pension, a boarding house and restaurant. He made arrangements for his fiancée to join him from New York. She came with her sister and she and Antoine were married. Together they worked to build up their pension with an emphasis on food. It soon outgrew its small quarters and Antoine’s moved down the block and eventually, in 1868, to the spot on St. Louis Street where the restaurant stands today. In 1874, Antoine became ill and left the management of the restaurant in his wife’s hands. After Antoine’s death, his son Jules served as apprentice under his mother’s tutelage for six years before she sent him to France for classical training in the great kitchens of Paris, Strassburg and Marseilles. He returned and became chef of the famous Pickwick Club in 1887 before his mother summoned him to head the house of Antoine. He was a genius in the kitchen and invented Baked Alaska; Cafe Brulot, a flamed coffee concoction with orange liqueur, cinnamon, sugar, clove and lemon peel; and Oysters Rockefeller, so named for the richness of the sauce. The oysters remain one of the great culinary creations of all time, but the recipe remains a family secret. In 1975, Roy’s son, Roy Jr., became proprietor and served until 1984. He was followed by William’s son, Bernard “Randy” Guste who managed Antoine’s until 2004. In 2005, Rick Blount, Roy Alciatore’s grandson, became current proprietor and CEO. Like the long line of the Alciatore family members and descendants, Rick guided Antoine’s through difficult times — his and the city’s misfortune: Hurricane Katrina. The wind was the main culprit and caused $14 million worth of damage to the building. The main four-story building collapsed, the top two floors of the building blew off, and the falling bricks crushed the adjacent building. Blount never left, he set up equipment on the street, and he and his returning kitchen staff cooked for first responders and construction workers. He started rebuilding as soon as he could, primarily because he wanted to hire back some members of the dining and kitchen staff as laborers, as a way to keep their cash and benefits flowing. Antoine’s reopened Dec. 31, 2005, about four months after Katrina emptied it out. 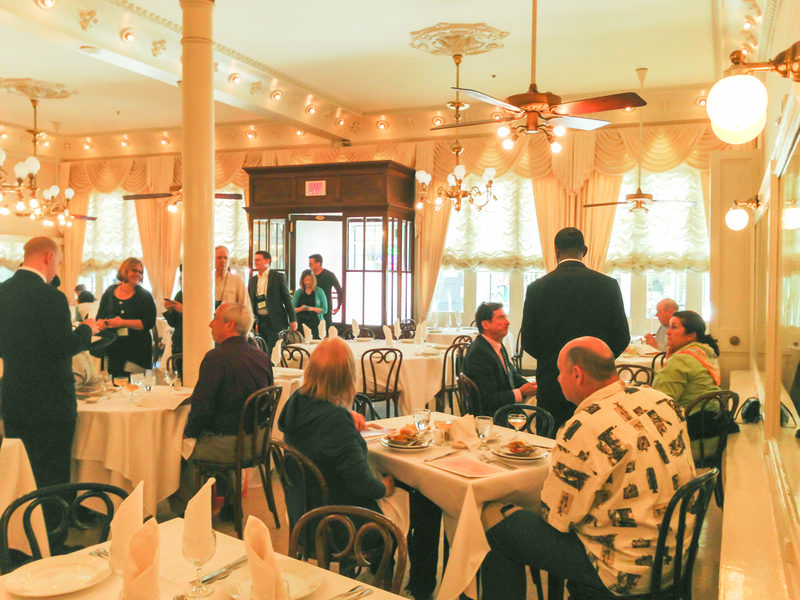 Antoine’s includes 14 dining rooms. The front entrance opens into the Main Dining Room, which was actually the original restaurant. Inside that room and to the left is the largest dining room, The Annex. 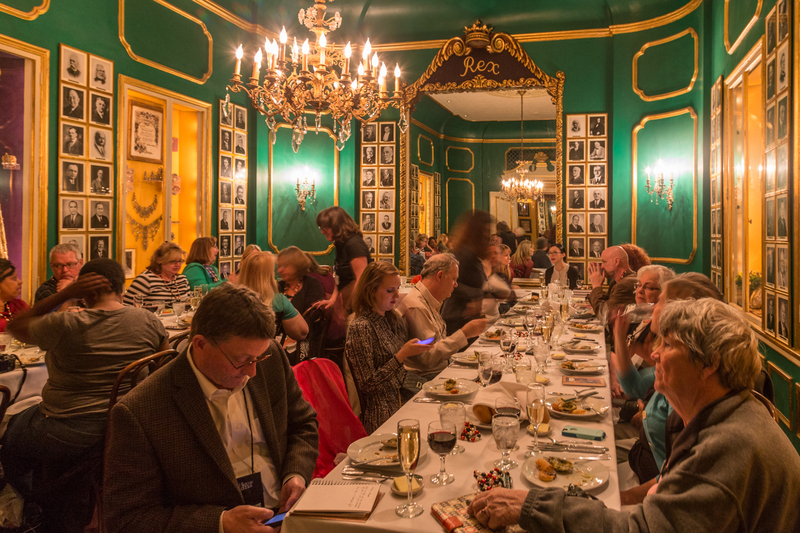 A series of small dining rooms are entered from The Annex toward the Bourbon Street side: The 1840 Room, The Proteus Room and The Escargot Room. Directly behind The Annex and across a hall from The Proteus Room is The Rex Room. 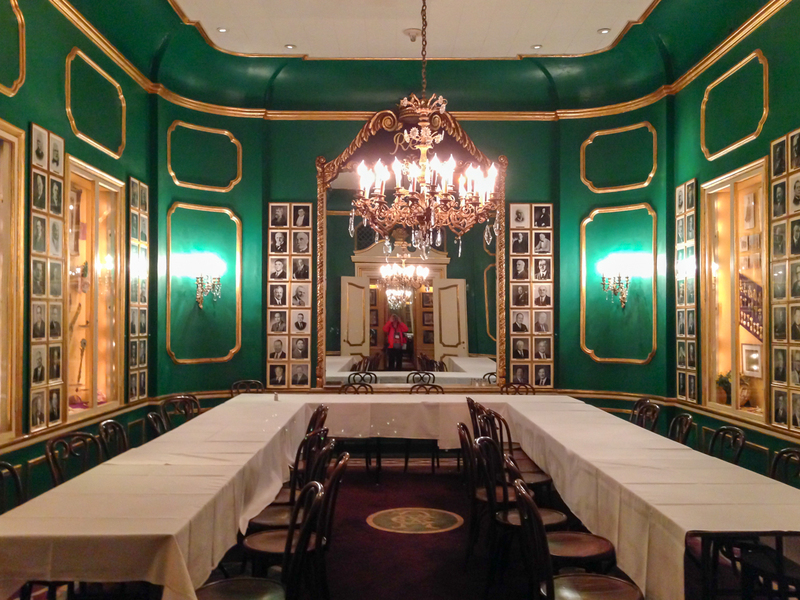 I had the thrill of eating lunch in the elegant green painted Rex Room. Rex is one of the original Mardi Gras krewes and it is Rex who is the King of Carnival. In April 1939, the Rex organization’s Carnival Kings’ Club, made up of former monarchs, began meeting in the 1840 Room. In a few years, those meetings moved to The Rex Room. 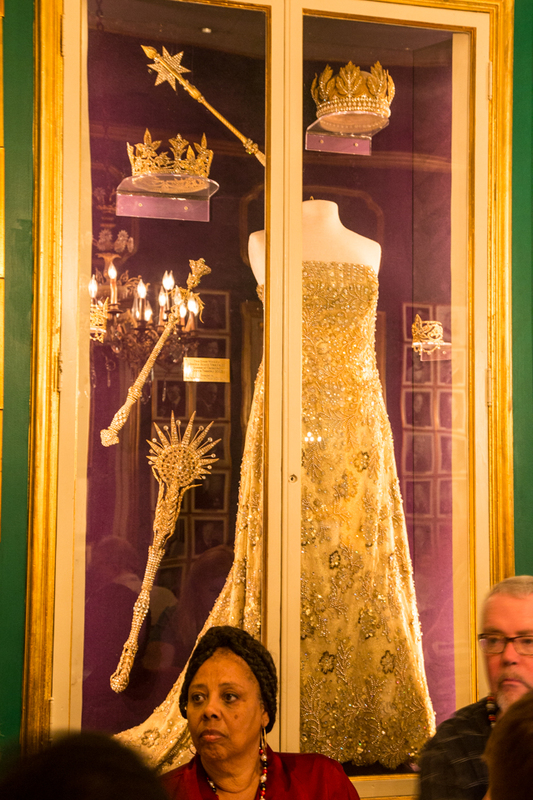 The Rex Room holds 20 to 50 guests and the Rex club supplies the decorations such as crowns and septers and photographs in the room. According to Rex archivist Dr. Stephen Hales, the Kings’ Club of ex-Rexes have met there annually. In recent years, Rex has claimed the restaurant for the organization’s luncheon on the Wednesday before Mardi Gras. 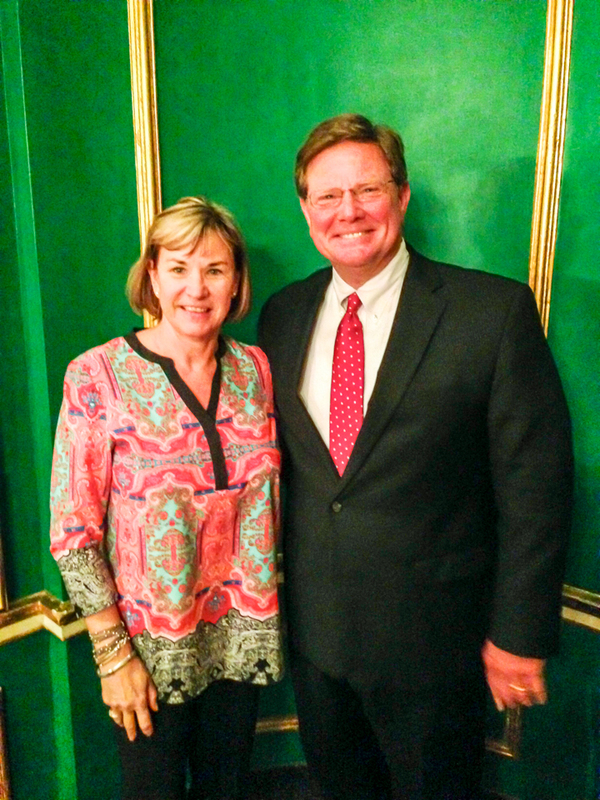 Rex also uses Antoine’s as the site for the annual dinner honoring donors to the organization’s Pro Bono Publico Foundation, a nonprofit group that supports community endeavors focusing on the public schools. According to Hales, the annual dinner is hosted by the two most recent Kings of Carnival and is another happy connection between the krewe and the restaurant.While the Rex organization members and families flock to the restaurant on the Wednesday of the week before, the largest Carnival group at Antoine’s now is the Krewe of Proteus. They meet on Monday before Mardi Gras (Lundi Gras) for a luncheon. 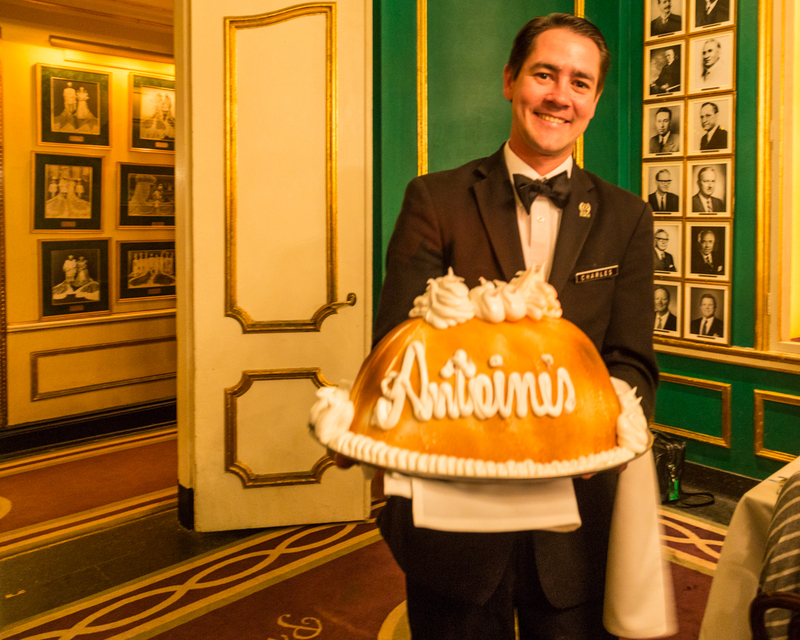 The Krewe of Hermes – whose memorabilia can be found in the Hermes Bar – has a luncheon at Antoine’s on the Friday before Mardi Gras. 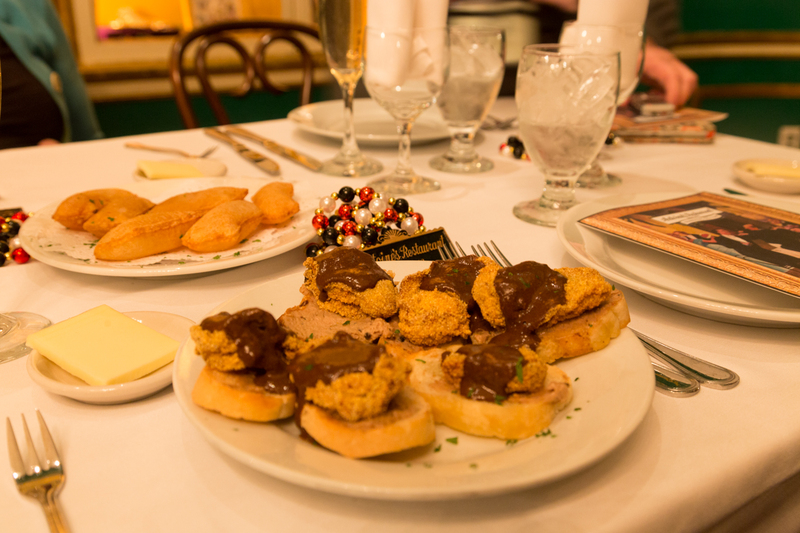 A final sign of Antoine’s involvement in New Orleans Carnival traditions is the late afternoon meal held there each Mardi Gras by members of the Mistick Krewe of Comus. This oldest Mardi Gras organization last had a street parade with floats in 1991. When the group originally was formed, it took inspiration from the holiday celebration in Mobile, Alabama. In that tradition, young men took to the streets and raided the stock of a hardware store to add to their merriment. Brandishing rakes and clanging cowbells, they raucously marched along their route and called themselves the Cowbellion de Rakin Society. And so, on Mardi Gras night, a group of men will emerge from Antoine’s – some wearing white tie and tails, some sporting papier-mâché heads. They will stuff their pockets with doubloons and cups for the onlookers on their route. They will be carrying cowbells and holding rakes, and, to the sound of a marching jazz band, they’ll carouse and march from St. Louis Street to the Canal Street hotel where the Comus Ball is held. 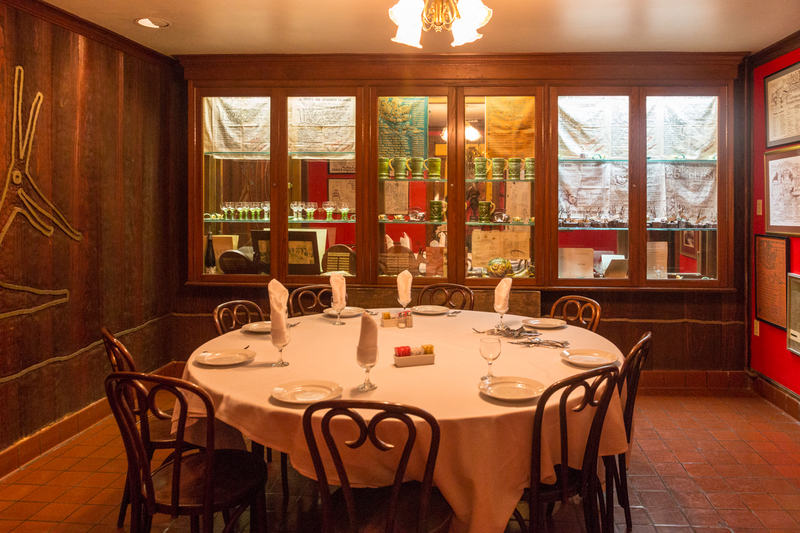 If you can’t dine in the Rex room, never fear; each of Antoine’s dining rooms has a unique history and charm. The Mystery Room acquired its name due to Prohibition, the 18th Amendment prohibiting the sale of alcoholic drinks (from 1919 until 1933). During this time, some would go through a door in the ladies’ restroom to a secret room. The thinking was that the Feds were not be brave enough to ever go into the ladies room during a raid; and Roy Alciatore was right. Patrons would sneak in and fill coffee cups with liquor to bring back to their tables. If ever asked where it came from, the standard response was: “It’s a mystery to me!” The name stuck and to this day, it’s still the Mystery Room. The Japanese Room was originally designed with Oriental motifs popular at the turn of the century. All of the decorations, down to the hand-painted walls and ceilings, spoke of things Japanese. Many large banquets were held there until December 7, 1941, when the Japanese bombed Pearl Harbor to usher the United States into World War II. Roy Alciatore then closed the room and it remained closed for 43 years. It was reopened in 1984. Recently the room has been refreshed with a new updated look that included the preservation of the hand painted ceiling. The Last Room or Tabasco Room is the last named room at Antoine’s. It is an intimate space with just one table and was recently renamed after one of Antoine’s most distinguished customers, community leader Paul McIlhenny of the famous Tabasco family. 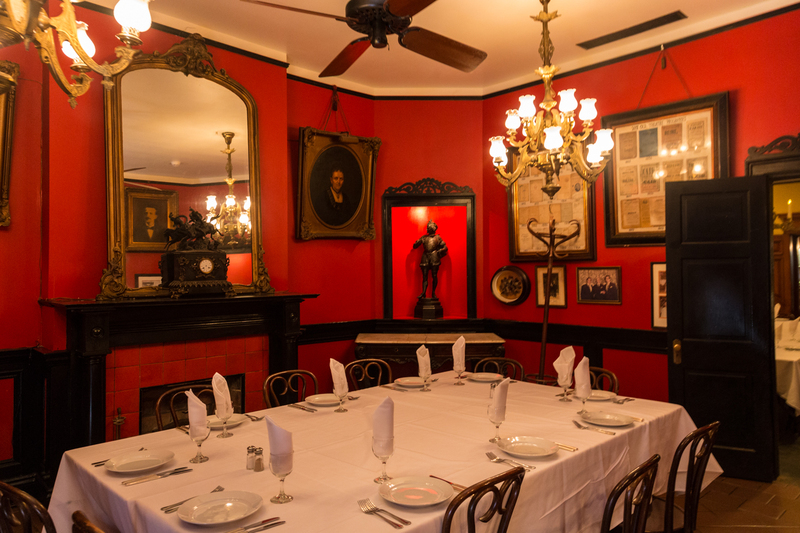 The room is appropriately painted “Tabasco” Red and is rumored to be the location of most engagements in New Orleans. If you’re in New Orleans, make a stop in Antoine’s and create your own history. Be sure to ask your waiter for a tour.